Abstract: Autonomous Surface Vessels (ASVs) have been developed for more than 20 years. Many ASV projects have been successfully realized, and as many are still under development. In literature there is a lack in research about different applications and suitable environments for the deployment of ASV. In our previous paper , we introduced the emerging concept of autonomous vessels. A multi-layer multi-agent control architecture of cooperative transport system from the perspective of ASVs were proposed. Moreover, detailed definition and categorization of autonomy levels for ASVs are proposed based on the characteristics of ASVs and existing classification of autonomy. 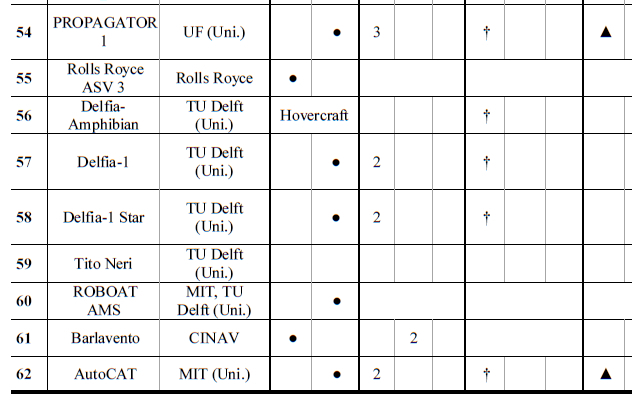 With this innovative autonomy level classification, we create an overview of existing ASV prototypes in this paper. The tendency and unknown future developments of ASVs are analyzed according to the divisions: the research on ASVs is rapidly increasing; the autonomy level is following the same trend, proposing new intelligent solutions; the scope of the newly designed autonomous vessels is shifting from small ASVs for scientific researches to bigger cargo crafts; the research of cooperation in ASVs are still at beginning but shows great potential. Reference: M. Schiaretti, L. Chen, R.R. Negenborn. Survey on autonomous surface vessels: Part II - Categorization of 60 prototypes and future applications. In Proceedings of the 8th International Conference on Computational Logistics (ICCL 2017), Southampton, UK, pp. 234-252, October 2017.